We published Stoner Fluxx to help accelerate the conversation in the US about ending marijuana prohibition. Children: Please don't smoke marijuana. Thank you for saying NO THANK YOU to Drugs! Young Adults: Listen to your parents, and follow their rules. Be honest with your parents. Adults: Does it really make sense to put people in jail just for smoking marijuana? Parents: We care about your kids and encourage them to seek your counsel on the subject of drug use. 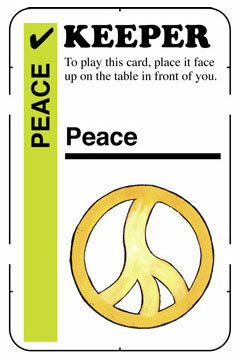 Retailers: We hope you will sell Stoner Fluxx - but understand and respect your choice if you don't. Stoners: Please talk openly and honestly about your marijuana use with your friends and family. Activists: Get involved! Here is a list of organizations to get you started. Organizations: Let us know how we can help the movement by giving away a few Stoner Fluxx decks! Many adults like to smoke marijuana to temporarily alter the way they feel and think when socializing with friends. Although it is not without risks, it is also not necessarily harmful. Marijuana has been shown to be an excellent medicine for many illnesses. We are working to change US laws that make it illegal to consume marijuana, even for responsible adults. Kids also like to play and have a good time, but you should avoid using any mood-altering substances, and not just because adults say so. These substances (including alcohol and cigarettes) can be very bad for you, and can affect your growth both mentally and physically. It really is a good idea to wait ‘til your body and mind have had a chance to finish growing first. Fluxx’s inventor waited until he was 30 years old before trying marijuana. He encourages you to wait until you are an adult to consider the decision to try it for yourself. Please give your body a chance to grow and your mind an opportunity to mature without the influence of any sort of recreational drugs. Thank you for saying NO THANK YOU to Drugs! If you live with your parents, they get to make the rules. If you think you are adult enough to smoke marijuana, you should also be adult enough to be honest with your parents about it. 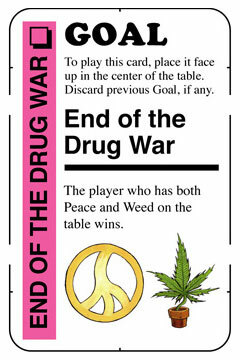 If you need a way to bring up the subject, try playing a game of Stoner Fluxx with them! It’s a fun easy game to play — start them on one of the other versions of Fluxx first to hook them on the game, and then pull out Stoner Fluxx and ask if they want to play the Stoner edition with you. Not all adults choose to drink and/or smoke. Ask your parents about the reasons behind their decisions — you might just find yourself growing up to make the same choices they do. Most adults who smoke marijuana do so responsibly. We don't think this should be illegal, and we published Stoner Fluxx to accelerate the conversation about reforming the marijuana laws. Thank you for talking and listening to your parents! We think adults should be allowed to smoke marijuana. Why is smoking pot illegal here in America, the so-called Land of the Free? Whatever your opinion, please talk with your friends, family and co-workers. Please talk about it. If you’ve assumed it’s right for marijuana to be illegal, please try to be open to the possibility of changing your mind. We don’t ask YOU to smoke pot — not even after the laws in your state change. You may never try it. But chances are good you know people who do. Ask them about it. Does it really make sense to put people in jail just for smoking marijuana? Lots of responsible people smoke pot. According to government figures, 70 million Americans have tried it. Should they all go to jail? If you agree we should end marijuana prohibition, donate to an organization fighting to change the laws. When voting, tell our government to STOP waging war on a large sector of our adult population who enjoy marijuana. We respect personal choice, but reject those who attempt to push their values on everyone else. History has shown that prohibition does not work. It's time to end marijuana prohibition. We encourage your kids to say No Thanks to drugs and to seek your counsel. 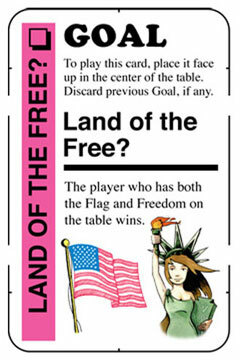 If you find your kids with Stoner Fluxx, try playing the game with them! Talk to your kids about your own experiences with marijuana from your high school or college years. Did you ever use it or know anyone else who tried it? Tell your kids to follow your rules, but please have an honest talk with them about the dangers of drugs. Thank you for understanding we are trying to make the world a better place! We understand that many game store owners will be hesitant to sell Stoner Fluxx. If you need help deciding, please ask for a free sample to review. We hope you will decide to sell this game, but respect your choice if you don't. To order, ask for LOO-420 from any of Our Distributors or contact Looney Labs directly. Fully Baked Ideas is an imprint of Looney Labs which was created to make sure children are not accidentally exposed to adult themes on our family games web site. We pledge to keep our consumer marketing materials for Stoner Fluxx separate from the literature and marketing for the rest of our family games. If the person seems interested, offer to let them keep your copy to show others. Tell your local Game Store and Head Shop about the game. Do what you can to get the conversation started about the need to put an end to marijuana prohibition. Thank you for helping us try to change the world! To find other ways you can help support the movement, please visit the web pages linked from our Organizations We Support page. If you have an idea for a way we can promote Stoner Fluxx and the movement to legalize marijuana by giving away a few Stoner Fluxx decks, let us know! Thank you for helping us try to change the world!